John Templeton Value is a value investing strategy based on the rules used by US investor Sir John Templeton. It combines value and growth factors to identify stocks trading at cheap prices but with a positive long-term outlook. The value components include the price-to-book and price-to-earnings ratios, while the growth rules focus on strong earnings and margins, and low debt. Sir John wrote: "Bull markets are born on pessimism, grow on skepticism, mature on optimism, and die on euphoria. The time of maximum pessimism is the best time to buy, and the time of maximum optimism is the best time to sell." His Templeton Growth Fund delivered a 13.8% annualised return from 1954 to 2004, versus 11.1% by the S&P 500 over the same period. Sir John also put a great deal of importance on qualitative factors, such as quality products, cost controls, and the intelligent use of earnings by management. American-born British stock investor, businessman and philanthropist. 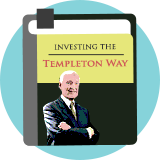 Templeton wrote more extensively on spiritual matters but, for those more interested in his investment philosophy, Templeton’s niece has summarized his early life and investment thinking in “Investing the Templeton Way”.